FANTASEA (1983) The fishing vessel Fantasea sank at Constantine Harbor January 1, 1983. FEARLESS (1901) The 248 ton steam whaling bark Fearless struck a rock while at anchor on the south side of Dutch Harbor November 30, 1901 and was lost. The vessel value at the time of the casualty was $30,000 no cargo. The crew of 28 all survived. The Fearless had departed Plain Bay November 3, 1901 bound for San Francisco. FLY BOY (1983) The 56 foot crab fishing vessel Flyboy capsized and sank February 27, 1983 off of Lava Point on Akutan Island. Captain Ove Haagensen (53) was lost attempting to right the vessel. Two other crewmen, Alex Tcherepaiyaoff and Dale Lott were rescued. FOREMOST (1977) The 166 ton 86 foot steel oil screw crab fishing vessel Foremost rolled over and sank May 4, 1977 approximately 75 miles east southeast of Saint George Island toward Cape Sarichef. All 5 crewmembers were rescued by the Seattle based fishing vessel Sea Venture. FOUR SONS (1978) The 72 foot fishing vessel Four Sons stranded and was lost December 22, 1978 on Unalaska Island. The crew was picked up by the American Viking and taken to Dutch Harbor. 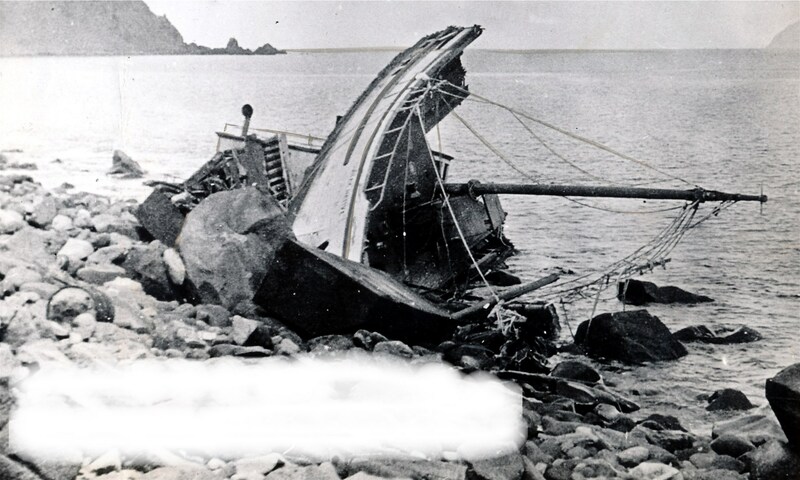 FREDERICK A (1936) The gas screw Frederick A drug anchor and stranded in Akutan Bay Sunday September 13, 1936 and was lost about 2 ½ miles east of the southern peninsula of Akutan Bay. There was no one on board when a gale blew the vessel ashore. The Frederick A was valued at $4,800 with no cargo and had no insurance. The hull became a total loss but the engine and equipment were salvaged. FUKUYOSHI MARU NO 85 The Japanese longliner Fukuyoshi Maru No. 85 was abandoned after an explosion and fire February 8, 1987 approximately 120 miles northwest of Dutch Harbor. One crewmember was lost and 25 others picked up by sister ship Fukuyoshi Maru 8. The U S Coast Guard sank the burned out vessel six days later. The Fukuyoshi Maru 85 was in use by U S National Marine Fisheries in a foreign fisheries program counting fish. The fire was reported to have started from a propane explosion in the galley of the ship. 49 year old Toshitaka Sakaguchi, a crewmember from Japan was believed to have died in the explosion.